The south-western region of Australia (bounded by Geraldton in the north to Esperance in the south) has a wide range of habitats from wet forests to dry scrubland. Accordingly, the range of bird species is quite diverse. This region is host to 17 endemic species, some of which also occur in South Australia as far east as Eyre Peninsula. The CD features a range of calls for this unique group, including those of some birds that are difficult to see such as Noisy Scrub-bird, Western Bristlebird and Western Whipbird, but which have loud ear catching songs. The calls of some other birds unique to this region such as Carnaby's and Baudin's Black-Cockatoos, Western Rosella, Red-capped Parrot, Rufous Treecreeper, Blue-breasted and Red-winged Fairy-wrens, Western Thornbill, Western Wattlebird, Western Spinebill, Western Yellow and White-breasted Robins and Red-eared Firetail are also included. Calls of many of the more common birds are also part of the overall presentation. Where possible, a range of calls of each species is presented, allowing the listener to become aware of the repertoire of sounds possessed by many of the birds, particularly songbirds. This album has no music or spoken commentary. The natural calls of the birds of this region can be appreciated both as a source of pleasant sounds, or as a well documented reference source of many of south-western Australia's bird species. A list of the species, with call description and behaviour notes, can be found inside the cover. For those people with a particular interest in any of the calls, further information can be obtained from the author. 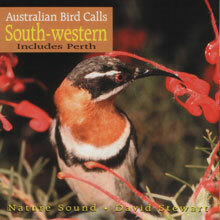 This is another CD in the Australian Bird Call series and contains calls of 79 species. Birds Australia, the largest bird organisation in the country, endorses and recommends this CD to anybody interested in enjoying and knowing the calls of many of Australia's wonderful birds found in the temperate south-western region of Australia.